On the 4th of November 2004, Liverpool Football Club unveiled a plaque at Anfield in the memory of Billy Liddell. At the unveiling of the plaque, inside the Kop by the entrance to the Club's museum, was Billy's widow Phyllis, Tommy Smith and Ian Callaghan, the man who eventually replaced Liddell in the Liverpool side. Phyllis said on this occasion: "This is such a great day for me and I'm sure Billy would have been very proud. The fact that so many fans still talk about Billy today, so long after he gave up playing, means he must have done something right for Liverpool. It's been a lovely day at Anfield and it was so nice to see people turn up to look at the plaque. I'm really touched." The plaque reads: "The great Billy joined Liverpool from Scottish Junior football in 1938. After RAF wartime service he made his League debut in 1946, winning a title medal that season and an FA Cup runners-up medal in 1950. His loyalty, versatility and consistency illuminated Anfield's gloomy era in the old Second Division. His deeds were such that the club was dubbed "Liddellpool". He and Sir Stanley Matthews were the only players to appear in the two Great Britain teams to take the field. Exemplary sportsman, he was never booked throughout his career. He trained only twice a week due to his accountancy work. 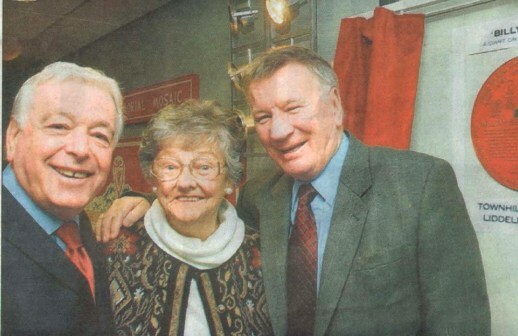 "Billy would be beyond price in any era", proclaimed his fellow legend Bob Paisley." "Billy Liddell, I salute you. You were a true legend. You were my first footballing hero. You were the best of all because of your LOYALTY, you were ours alone. A true Hero. For the likes of me growing up in Liverpool during the late 50s, I am too young to have seen the man at his best, we simply hung onto the stories that our parents and families told, with a determination and gobsmacked awe."